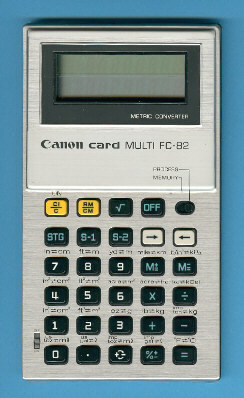 Size: 4.7" x 2.8" x 0.3"
The Canon FC-42 started with its "sibbling" Toshiba LC-838 started a long line of Metric Converter calculators based on Integrated Circuits (IC's) developed by Toshiba. Canon introduced already in 1974 with the FC-80 their first metric conversion product with a LED display based on a calculator chip developed by Hitachi. This unique FC-82 shares its novel two-line display with the MD-82 introduced in the same time frame. The second line displays either the contents of the memory or the converted value. © Joerg Woerner, January 1, 2007. No reprints without written permission.